The 1st Virtual ICA 2018 was a big success! 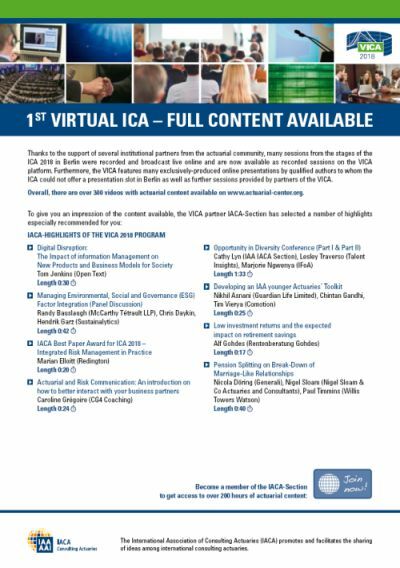 With live streams from 7 lecture halls, recorded sessions and several hours of additional content the Virtual ICA 2018 allows a much broader audience from all over the world and helps to secure this knowledge in a sustainable manner. 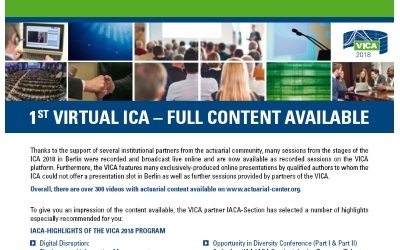 Visit www.actuarial-center.org in order to listen to many recorded sessions from the stages in Berlin and further many exclusively-produced online presentations by qualified authors to whom the ICA could not offer a presentation slot. The IAA partner Section IACA has selected a number of highlights recommended for all actuaries interested in topics related to IACA.